Every Fridays, MSA provides a room at City Campus Union for Jumma prayer from 1:30 to 2:30pm. The room reservation schedule for the summer session is not available; however, we do send an email every Friday with the details. (Please send us an email to join our mailing list). We do not hold weekly meetings during summer session. We are excited to see all in Fall 2016 inshae Allah. The time and location will be decided at the beginning of the semester. MSA room can be used during the day as a prayer room. Contact one of the board members for the access code. For further questions and assistance, please send an email to msa@unl.edu or refer to the contact information at the buttom of the page. The Muslim Student Association (MSA) would like to welcome you warmly both to the scientific atmosphere of UNL, and the Islamic community of UNL and by large the city of Lincoln. From an Islamic perspective, we would like to assure you that Lincoln enjoys a lovely Islamic community that you will find most courteous and inviting. Not only you will find a good number of brothers and sisters who are willing and happy to acquaint you with the school environment, but you will also notice that the Islamic presence extends beyond the boundaries of the school. 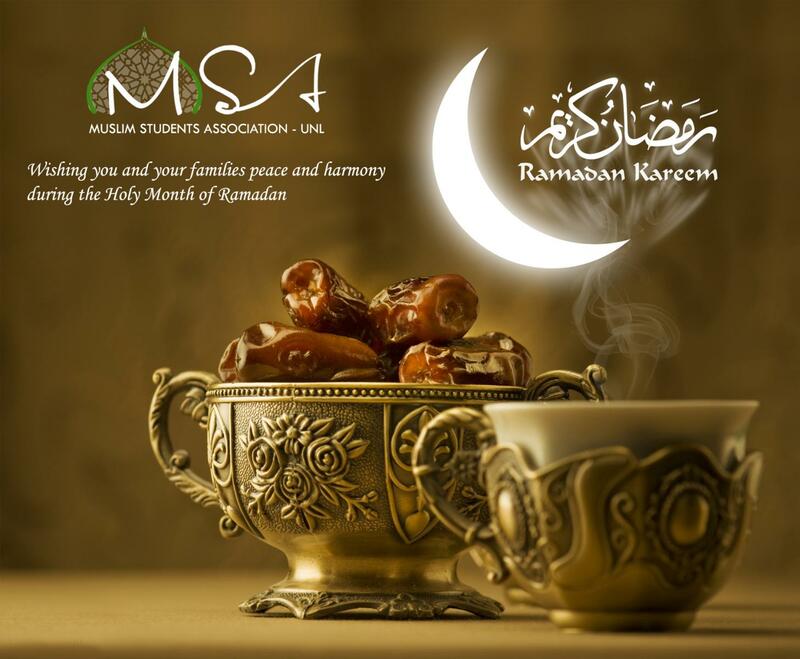 The Muslim Student Association wishes you and your families a very blessed month of Ramadan full of iman, forgiveness, and closeness to Allah (swt). May this Ramadan be a humbling and inspiring experience for all, and encourage us to help generously those who are not as fortunate as we are. May Allah purify our intentions and accept our good deeds. Amin! MSA invites all UNL students to the event "Islam Awareness Week" taking place Feberuary 23rd - 25th at City Campus Union. Join us to know about ISLAM, ask us if you have any questions/misconceptions and enjoy mediteranian sweets. More details can be found here or in the facebook event page. The mission of the Muslim Student Association at the University of Nebraska - Lincoln is to provide students, faculty, and the community of Lincoln with resourceful information on Muslim beliefs. Whether you are a Muslim or not, the MSA is actively working with other campus organizations and the community to provide you with a clearer understanding and connection to the religion of Islam. The views presented here are those of the Muslim Student Association student organization and do not necessarily reflect the views of the University of Nebraska–Lincoln.